Image caption Coventry City said there could be "no excuse for entering the field of play"
A Coventry City supporter who invaded the pitch to confront their players during a home game has been banned from the Ricoh Arena for life. 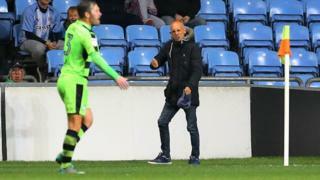 Darren Kedzierski ran on to the field in Tuesday's 1-0 defeat against Forest Green Rovers. He shouted at his team's players before being escorted off by club captain Michael Doyle and a steward. In an interview with the Coventry Telegraph, he said he told the players he was "fed up" of watching "rubbish". West Midlands Police is investigating, says the club which has issued a statement detailing the ban's terms. It said Mr Kedzierski had been issued not only with a lifetime stadium ban that applied to all events including music concerts, but a club ban that applied to home and away matches "for the foreseeable future". The statement read: "We know that football is an emotional game, and that Tuesday's game was a frustrating one for supporters. However, there can be no excuse for entering the field of play." In the Coventry Telegraph interview, Mr Kedzierski, a supporter of the club for more than 40 years, said players were not "putting in any effort". He stressed he "wasn't abusive" as he explained to player Michael Doyle the club was "in disarray" and admitted "a bit of remorse" following his actions, which he described as "the only way I can show what I think about the club that's doing its best to alienate everyone".